Pepperoni is far and away America's favorite pizza topping (as long as we're taking cheese and sauce as a given). Whether you like your spiced meat thin and large or curling up at the edges to make little grease pools, your favorite national holiday has arrived: National Pepperoni Pizza Day. 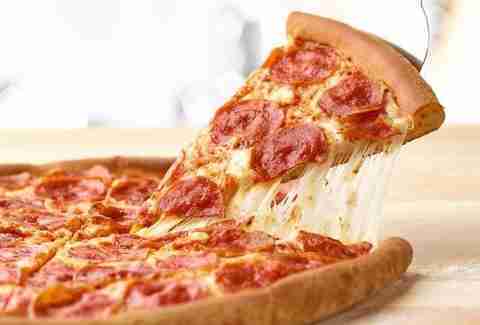 The cheesy "food holiday" lands on Thursday, September 20, and all sorts of popular pizza chains -- Domino's, Pizza Hut, Papa John's, Little Caesars, and more -- are celebrating with deals for super-cheap pizza. It's a day that invites celebrations of the most obvious kind. (It rhymes with pizza party.) Oh, and speaking of cheesy days, it also happens to be Free Queso Day at Moe's Southwest Grill locations all across the country. So, not only can you get cheap pizza, you can also score some free cheese dip while you're at it. To help get your party going, here are some of the best deals you'll find in honor of pepperoni's big day. The deal: Buy any large menu-priced pizza and you can grab a $1 medium pepperoni pizza with the code "PEPPERONI2018." The deal: The California-based pizzeria is offering buy-one-get-one-free pepperoni pizza pies and slices at all locations. The deal: Grab the "Mix & Match" offer, which will get you two or more pizzas, pastas, bread bites, boneless chicken wings, and more for $5.99 each. The deal: Drop the code "PAPATRACK" and you'll land 25% off any regularly-priced pizza purchased online. The deal: It's pepperoni and then some. Get the limited-edition 5 Meat Feast pizza for just $9. The deal: Have yourself a pizza party with a medium pepperoni pizza to-go for $3.99. You can grab up to three per order. The deal: Order some pizza from the take-and-bake pie purveyor and you'll get a pepperoni pizza for free with this special National Pepperoni Pizza Day buy-one-get-one free (BOGO) offer. All you have to do is order a pizza a regular menu price and you'll be able to add a Large Signature Pepperoni pizza with Original crust for free. Just use the code "FREEPEP" when you order from participating locations. 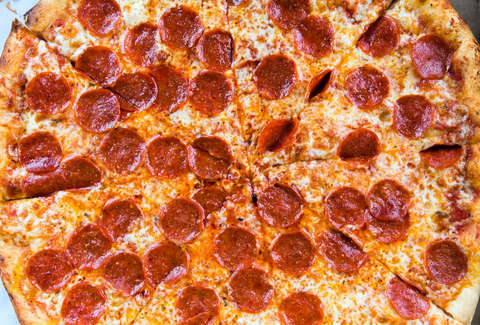 The deal: All 17 locations will be offering up the Urban Classic Pepperoni Pizza for just $4 in honor of the holiday. The deal: The pretzel experts at Auntie Anne's make a pretzel dotted with pepperoni slices. Sign up for the Pretzel Perks program, and you get a free pretzel immediately. Use it on a pepperoni pretzel and you might be able to mix up the menu enough to eat nothing but pepperoni-inspired dishes for an entire day. The deal: Grab an $8 pepperoni flatbread in honor of pepperoni's big day. The deal: Take home a large 18-inch pepperoni pizza for the cost of a personal pie ($10) at the Minneapolis-based pizza shop. Also note that any pizza is a personal pizza if you eat it all yourself. The deal: Steer the car toward the Golden Arches because the roadside beacon is offering free fries on Fridays and $1 sandwiches any day from now through September 30. Both deals can be found on the McDonald's mobile app. The deal: It's Free Queso Day, and that means everyone is getting free queso and chips just for stopping into Moe's. The deal: For a limited time, you can treat yourself to a 50-cent Frosty. You should probably dip some of those free fries from Ronald into the Frosty. The deal: To celebrate the return of the Panda's Honey Sesame Chicken Breast, get $3 off any online order of $5 or more with the code "HONEYISBACK." The deal: Grab a free appetizer with the purchase of any two entrées. Though, you have to show a coupon to get the deal. If that confuses you, ask your parents what a coupon is. They used to use them all the time. The deal: Every day this month you can get 10% off your order and a chance to win college football tickets when you use the code "SUBABOVE10." If you know of National Pepperoni Pizza Day freebies and deals we missed, email us at news@thrillist.com and we'll add 'em here.